A Mt D'Or family of five may soon get a roof over their heads after their home was destroyed by a landslide during heavy rain on Tuesday. Karen Telesford, her husband Leon McKain and three grandchildren escaped with only minor injuries as they fled from the house. Telesford said they had earlier noticed there was land slippage near their home and cracks in the wall. 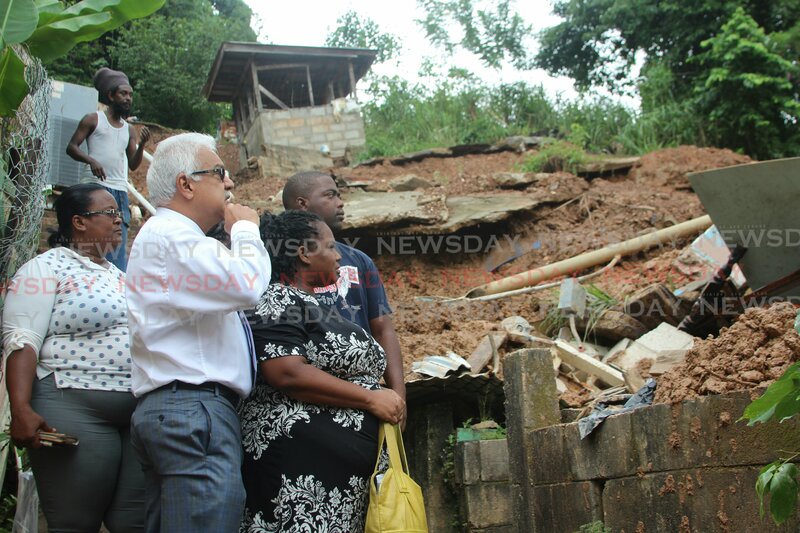 Speaking with Newsday in a phone interview on Thursday, Telesford was thankful to their MP, Terrence Deyalsingh. "I have to say Mr Deyalsingh is a wonderful man. He was been coming to the site every day to see that everything is okay with us. It is good to see an MP do so much for citizens. He is giving 110 per cent. "He promised to help us get a place rent-free for six months and somebody found a place at Second Champs Fleurs. We are awaiting the final word from him, because we understand that the rent is $500 more than they were willing to pay. I don't know if we could make the landlord understand how serious our situation was and reduce the rent, but if not, we will have to pay the diffference." Reply to "Mt D’Or family gets help from St Joseph MP"